Drink half of contents or less. No refrigeration necessary. Use or discard any unused shot after 3 days. Drink entire contents of bottle at once. Contains about as much caffeine as a cup of coffee. To avoid jitters, sleeplessness and rapid heartbeat, limit or avoid products containing caffeine. Not for use by children, pregnant women or individuals sensitive to caffeine. 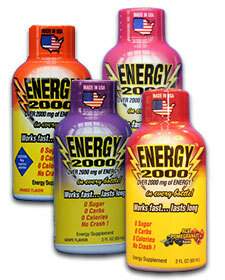 Energy 2000 contains Niacin (as Niacinamide) so some people may experience a flush feeling, hot sensation or redness of skin that lasts for a few minutes. Do not consume more than 1 shot every 6 hours. Phenylketonurics: Contains phenylalanine. † This statement has not been evaluated by the Food and Drug Administration. This product is not intended to diagnose, treat, cure, or prevent disease.